It’s not what you’d do with a million, if riches should e’er be your lot. It’s what you’re doing at present, with the dollar and quarter you’ve got. I can still hear him laughing. He had a regular laugh, for things that were mildly humorous and he also had a rollicking laugh if something was really hilarious. I can still hear him, when I want to, and it’s so clear. It’s been almost seven years since I’ve heard him with my ears. Memories are like a treasure chest full of gold and jewels that you can open any time, day or night, but no one can steal them! 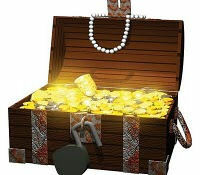 My treasure chest is overflowing. I’m so grateful to the Lord for my memories. Recently, I thought of my friend who left our church a few months ago. I haven’t seen her since. If I concentrate really hard, I can hear her soft voice and her sweet southern accent. I can hear the way she used to phrase things. I can remember burdens she shared and stories of her life. I can bring it all back. I miss her. I miss her laugh, her voice, her presence. Goodbyes are so hard. Today, I am longing for the city that my Dad called “home”. He’s there now! I call this place “home”, too. It has streets of gold, a crystal river, and best of all, my Savior, Jesus Christ, is there. He is preparing a place for me (John 14:2-3), and one day, I’ll get to be there. There will be no more goodbyes. I won’t have to be comforted by memories, for I will no longer miss anyone. That will be a wonderful day, indeed. Will you have a home in Heaven someday? If you’re not sure, please click HERE. If you have any questions, please contact me. I’d love to tell you about my home.